Farming, in some ways, has changed dramatically over the years. Quota's were introduced in 1984; the Milk Marketing Board, which was set up in the 1930's, was disbanded in 1994; due to BSE and the alleged connection between BSE and CJD an export ban was put in place in 1996 preventing all exports from the UK of beef and then there was the Foot and Mouth crisis in 2001. Each of these events, and many other smaller ones in between, have had a significant effect on the way farmers in the UK operate today. 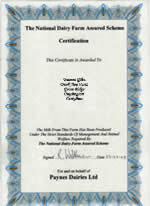 As a direct effect of the the MMB finishing, Payne's Farm Dairies evolved. There are currently over 120 farms producing milk for Payne's totalling in excess of 480,000 litres of milk per day, some of which is processed at the dairy in Boroughbridge, the rest is sold in bulk to other dairies across the country. Paynes Dairies only use British milk, this is supported by the red tractor logo as displayed on all our packaging. Hygiene is of paramount importance to both the dairies and the farmer and in order for customers and the eventual consumer to have complete confidence in the quality of the product Payne's Dairies have developed, in conjunction with NDFAS (National Dairy Farm Assured Scheme), a Welfare of Dairy Cattle and Code of Practice for Quality of Milk Production which covers all aspects in the production of milk, both in terms of hygiene and welfare. The aim is to provide producers with procedures and codes of practice that they can implement which will ensure that Payne's customers have the confidence that the dairy products they produce are from quality sources. The National Dairy Farm Assured Scheme has been developed to set standards for the quality and hygiene of milk leaving the farm. Payne's Dairies are keen to implement these guidelines and the producers of milk which it purchases have certificates from NDFAS to show that they adhere to these guidelines. Click here to go to the NDFAS web-site for more information. Farmers need to be aware of the pricing structure for the milk that they are selling. This changes regularly according to the market but at Payne's Dairies we endeavour to get the best possible prices for the milk and pass that on to the producers. A milk sample is taken from each farmers bulk tank daily to ensure that the milk being collected is of a high standard.